The origins of dodgeball are fairly sketchy but it has been a popular game for a considerable period of time. The game is a regular part of physical education classes in schools and the popularity of the sport reached new levels thanks to the motion picture ‘Dodgeball: A True Underdog Story’ featuring Vince Vaughn, Ben Stiller and Christine Taylor. The main objective in dodgeball is to eliminate all members of the opposing team by throwing the ball at them. Plays must dodge the ball to remain in the game and the team who manages to eliminate all of their opponent’s first are deemed the winners. There is no fixed amount of players that are needed to have a dodgeball game, with games varying between small numbers to large players. A lot will depend on the space available to play the game and the overall pool of player available. School leagues or regulated games will have a set number of players, which again will differ from each league. There is no fixed dimension and area for a dodgeball game with the game going ahead on the most appropriate surface and venue. Similarly, there is no universal agreement on the balls that are used in a dodgeball game. Players operating in a league format would be expected to all play with the same ball size or type but this can be agreed by each individual league. Many consider it to be of benefit to play with an odd number of dodgeballs so there is always scope for a team to be on the offensive. The game commences with the opening rush. All the dodgeballs are lined up in the centre of the court, with both teams rushing from their base line to the balls. Players have to simultaneously grab and throw a dodgeball or roll it back to a team-mate. To play dodgeball, the minimum amount of equipment required is 5 balls and a court to play on. In a regulation game, uniforms can be worn. 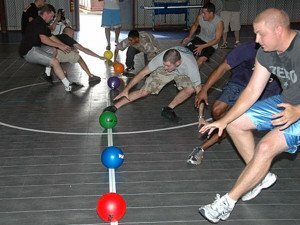 While there is no real point scoring in dodgeball, the aim of the game is to eliminate players of the opposing team, which can be done in a number of ways. The most obvious way is hitting an opponent with a ball, if a player is hit and the ball is not caught before becoming dead, that player is eliminated. However, if a player throws a ball that is caught by an opponent, the throwing player is eliminated from the game. Some variations of the game allow for a reinstatement of players if their team catches the ball. This can ensure the game lasts for a longer time-period and provides an incentive for catching the ball, as opposed to just dodging the ball. A player will eliminate themselves if they run out of the court of play. The game is over when all of the players on one team are eliminated, resulting in the other team winning the game. If both teams still have members at the end of an allotted amount of time, the winning team will be the one with most players. If this still results in deadlock, overtime can be played. The number of players, number of balls, size of court and length of game can be determined by the organisers. Players must remain within the court at all times, unless collecting dead balls. Players are allowed to leave the court to collect balls but they are not allowed to throw the ball until they are back within the court. If a player leaves the court for any other purpose or they throw a ball from outside the court, they are eliminated. The rules regarding headshots can be decided upon personal preference or by order of an official body. Some games will see the throwing player eliminated if an opponent is stuck on the head, some games will see the player struck on the head eliminated. Players struck with a ball that is then caught before it becomes dead are eliminated. When a player catches a ball, the throwing player will be eliminated.